Support for Newcomers in Moose Jaw - Gateway to Canada | Canada Immigration Consultancy! Moose Jaw is a city in south-central Saskatchewan, Canada. It is known for retirement and tourist destinations. 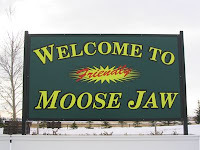 Some of the tourist attractions in Moose Jaw are Tunnels of Moose Jaw, the Temple Gardens Mineral Spa, Captain Jacks River Boat Tour, The Western Development Museum, Casino Moose Jaw, the Murals of Moose Jaw, and Hopkins Dining Parlour. Saskatchewan is now becoming one of the favorite destinations of Filipino Workers in Canada. Consistent with the Government of Canada's commitment to provide support for newcomers in Canada, it recently announced funding to help the Moose Jaw Multicultural Council deliver settlement services to newcomers in Moose Jaw. Moose Jaw, August 21, 2008 — The Honourable Diane Finley, Minister of Citizenship and Immigration, today announced funding to help the Moose Jaw Multicultural Council deliver settlement services to newcomers in Moose Jaw. Click here for the official website of Moose Jaw.